It's the start of the year and time to share some things. 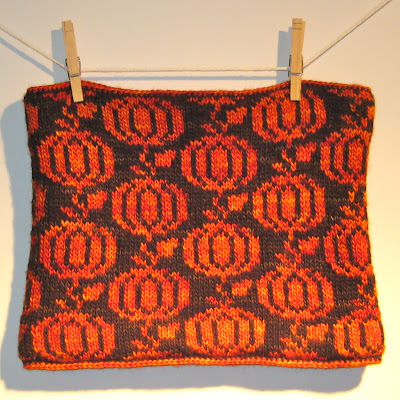 I have two new-ish (I published them in the fall of last year) patterns. *my apologies on the scary coloring of the pic. As soon as fall weather hits I cannot get enough of Pumpkin themed stuff. Large glittered pumpkins ala Martha Stewart, nerdy carved jack-o-lanterns of Firefly characters, Trader Joe's pumpkin greek yogurt... 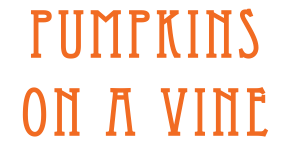 I think the only pumpkin thing I don't like is Starbucks Pumpkin Spice Latte's (I hate them with a fiery passion despite their excellent cozy marketing). So this year I decided to whip up a quick pumpkin pattern that could be used before and after Halloweeen, something that could be worn a little longer than the Hocus Pocus pattern. The chart for this one is fairly small so you can adjust the pattern easily if you wish to change the yarn weight, size of the cowl, or if you want to use it for something else altogether. This winter hat was designed on a lark Christmas 2011 and is the first thing I knit using yarn I spun (the green and grey version). The green yarn was an awesome sparkly batt I got from the Renegade Craft Fair in Brooklyn a few years ago, post pool, pre riverside. The grey yarn is alpaca that came from a farm in Callicoon, NY. We visited the farm and got to meet all the alpacas. If you have a chance to visit an alpaca farm I highly recommend it, they are adorable and so soft. 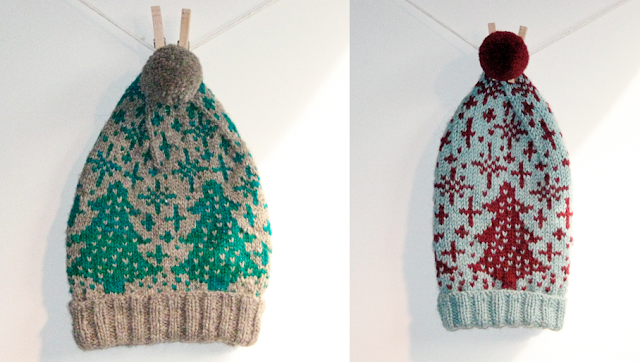 The pattern includes instructions for a large or medium hat using bulky, aran, or dk weight yarn. Once again I went back "home/home" (CO as opposed to "home" which is NY) for 12th night. Christmas day was spent in NY seeing Les Mis and eating Chinese food like 75% of the population of the city. No lie, I took a lovely walk from the theatre in Chelsea to my favorite Chinatown dumpling place and I passed multiple people talking about Russell Crowe's singing. 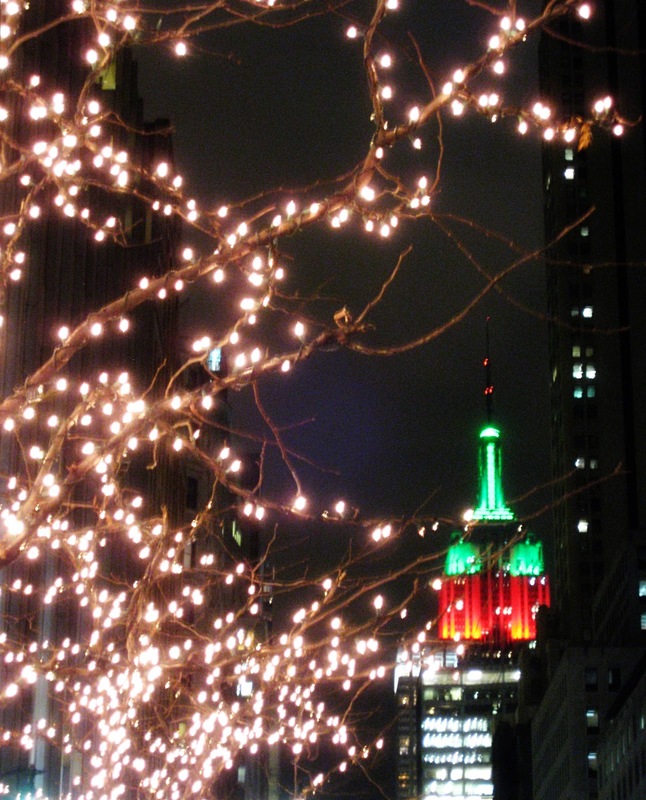 I decided to take a bunch of "Christmas in NY" pics this year. I know it's a fairly common subject but NY does the holidays so well. 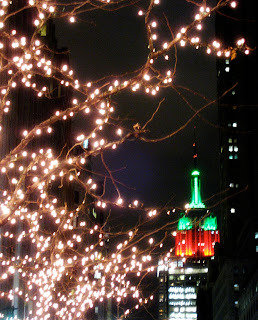 If Christmasy pictures of NY are your thing, there are a lot more in my flickr. A few days after Christmas I took off of Colorado for some fresh air and family. My deer friend came around to see me. *please note that this is an absolutely horrible example of how to behave with wildlife. 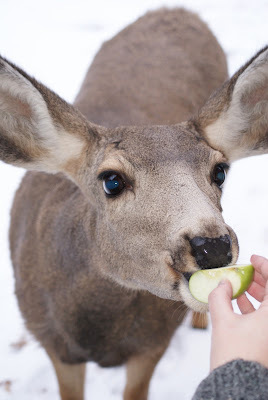 Deer are wild animals and can hurt you. If I still worked at the zoo I would be getting a stern lecture right about now. Yes, I worked at a zoo in high school. We named her Stella. This is the second time she has visited me at Christmas. Most of the deer are not afraid of humans but don't dare approach, Stella on the other hand is curious and will walk right up to our door and sniff until someone comes out to see her. In internet terms, she thinks she's people. The rest of the trip was lovely even though I was working through that dreadful flu that swept the country. I saw high school friends, post college friends, and spent many marvelous hours sitting in the kitchen jabbering at my mom. I also fit in a few trips to my favorite Colorado Springs places Panino's, Wimbergers, Salsa Latina, La Casita and fit in a movie, Silver Linings Playbook, with my dad at the awesome indie theatre, Kimball's, where they still allow you to bring ice cream from the the amazing Josh and John's next door. Not so fun fact, movies are a good $5+ cheaper in CO than NY. 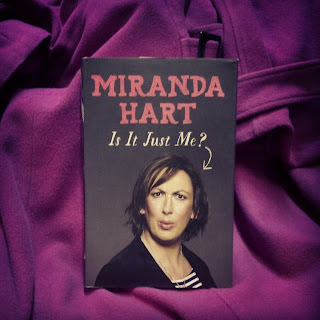 Lastly, over Christmas vaca I discovered Miranda. I'm completely obsessed. I think I've watched every episode 10 times at this point. Had to order this from Amazon UK which is surprisingly affordable and fast. My mom, ever ready to replace TV watching with book reading, ordered Miranda Hart's book from Amazon UK as well. It's going to live with Tina Fey and Mindy Kaling's books on the awesome and very funny ladies shelf. Well it is lovely catching up with the dear blog again. Now I am going to go enjoy the snow that fell last night.